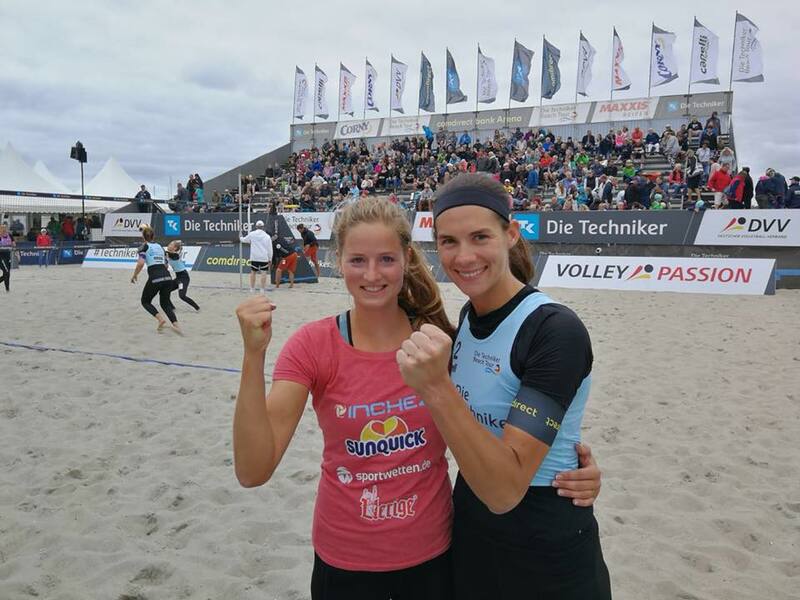 While Kira Walkenhorst’s temporary partner Leonie Kortzinger was away this week playing at the World University Championships in Munich, Walkenhorst found an interim-temporary partner for this week’s German Beach Volleyball Tour stop in Kuehlungsborn. She and Lena Overlander advanced to the semi-finals on Saturday thanks to a 2-0 win over Classen/Interwies, the tournament’s 10th seeds. Now, on Sunday, Walkenhorst/Overlanders will play #2 seeds Kranbaum/Niemczyk for the right to advance to the final. Walkenhorst, who is the defending World, Olympic, and European Champion in beach volleyball with partner Laura Ludwig, missed the first part of the beach season while recovering from injury. With Ludwig having given birth to her first child 2 weeks ago, Walkenhorst has had to find new partners to play with this summer, as she focuses on her own health and the German Tour. For most of the summer, that’s been the young, tall blocker Kortzinger. After a slow start, the pair advanced to their first final together in early July in Dusseldorf, where they would eventually fall to Melanie Gernert/Elena Kiseling. In the quarterfinals of that tournament, Walkenhorst and Kortzinger beat Overlander 2-0. Overländer, who typically plays with her sister Sarah, has virtually no international experience on the beach. Her biggest accomplishments have actually been on the snow, where she won the German snow volleyball champiosnhip and qualified for the European Championships in March. Her sister plays professionally indoors in Germany’s top-flight Bundesliga, and so Overlander played in the snow with Karoline Frohlich. Although Walkenhorst is slightly taller than Overländer, Overländer has been playing the block with Walkenhorst on defense. When Walkenhorst and Ludwig play together, Walkenhorst is the blocker, but she’s shifted to defense this summer while playing with the taller Kortzinger. Kortzinger and her partner Leonie Klinke finished in 24th place at the World University Championships. They had to withdraw from their last 3 matches with an injury. Ludwig gave birth to her child on June 28th. Walkenhorst is also expecting a child in December of this year, but her wife Maria is carrying the baby.